To see her is to take a sudden chill. 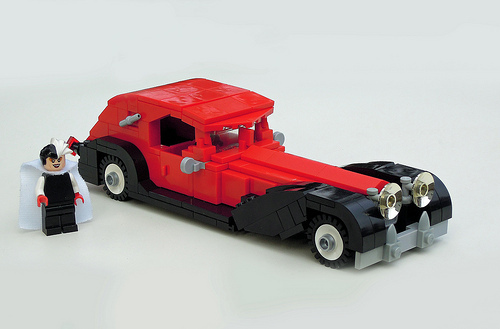 Presenting Cruella de Vil’s sweet ride from the Disney film 101 Dalmations, as interpreted by Cole Edmonson. The car used in the 1996 live-action version was based on the Panther De Ville, produced from 1974-85 by British car company Panther Westwinds. Cole includes a fairly accurate Cruella minifig to go with it; the only thing missing is her ever present cigarette.